Wrong Font Used In Display Box - Help! When I loaded a new graphics font it I needed, it corrupted the Roxio display box font with the same graphics. This is the display box in the RH bottom corner that displays when a DVD or a CD is put in the CD/DVD drive. I tried deleting the font, erased the entre NXT2 Creator Program, and restarted with the same results. I know this must be a simple fix, but I cannot figure it out. Show us please with a picture. That is the Roxio Burn Desktop Application. 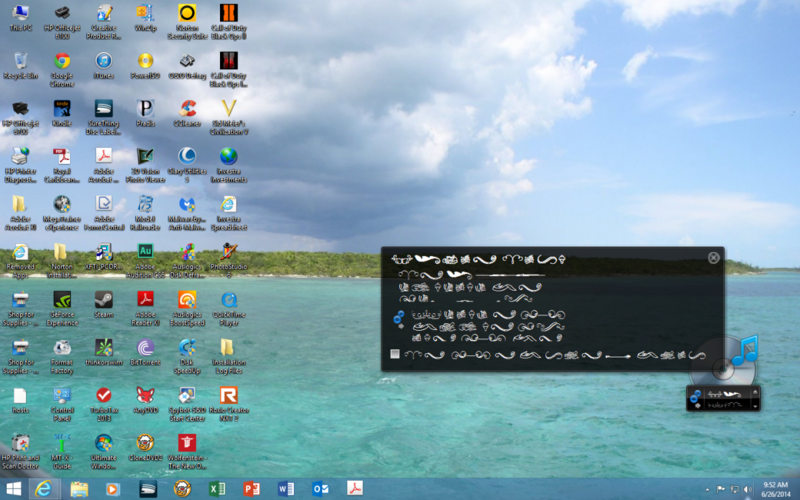 What language is your Windows installed in? What language did you install Roxio in? English for both. ONLY the Roxio Burn application displays the graphics font All other display boxes are perfect. Turn off all programs and antivirus/Firewall software put the Roxio Disc in a drive and run it choose repair when offered. Reboot the PC when done and see if that fixes it? Do you use the Roxio Burn Application ? If not, disable it and see if you still have the same problems. But suggest that you do the "repair" of the program first s suggested. I did use Roxio Burn when I could see the font. I did the repair including removing the font (or what I think he font is, an the problem is still there. I never told you to do anything else! Please explain what you did? 3. Removed Graphic Font - or what I think it is. 4. Restarted Windows -- Checked Roxio - Still a problem with the font. 7 Problem is still there. Removed Graphic Font - or what I think it is. Please explain what you did "Removed Graphic Font - or what I think it is."? I just fixed the problem. One of the Graphic Symbol Fonts was corrupting the Roxio Fonts. I deleted the font and the problem was immediately fixed. It was NOT the font I was thinking it was. Thanks for your help. So for other's information if needed---What was the font that was causing all the problem ?? I don't think he wants us to know! If it was "corupting" the included Roxio fonts it would be nice to know. But you're probably right-- he doesn't want us to know. It is not that I don't want to tell, I just don't know the name of the Graphic Symbol font I deleted. It was a foreign sounding name that was free. I deleted several that looked like they matched the symbols on the screen. Thanks for the reply Sam. Fonts can be removed directly from the control panel once incorporated into the system. It appears he found the correct one to remove, which probably installed itself as primary. Nice responses though. Gotta love the encouragement to participate. I had the same problem and found that the font that caused me problems was "Van De Velt" or something similar. Removed it and the program was back to normal. I was able to read the menus again.